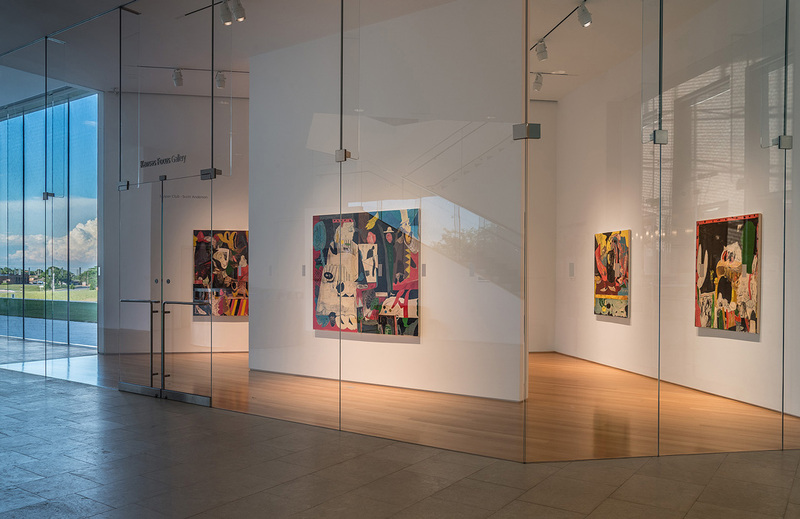 “Supper Club,” Scott Anderson’s exhibit in the Kansas Focus Gallery at the Nerman Museum of Contemporary Art, is a big abstract mess, but that isn’t a bad thing. 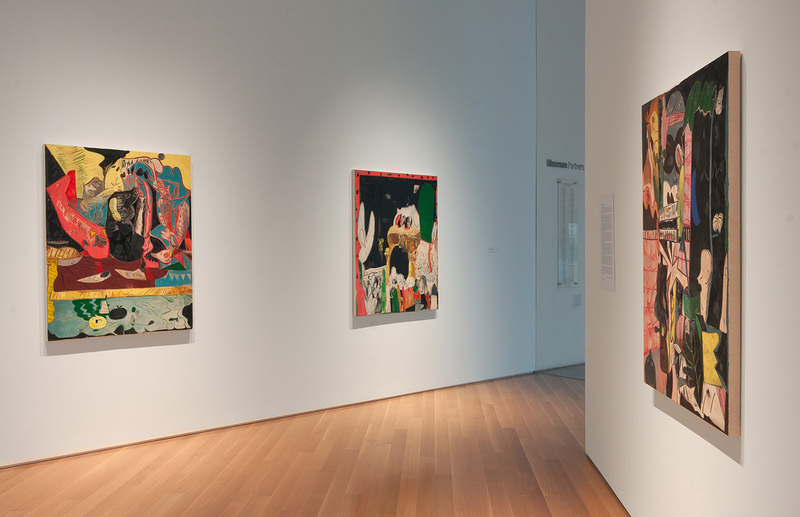 The show’s six paintings by the mid-career New-Mexico based artist, a K-State grad and Pollock-Krasner Foundation Grant winner, look like the aftermath of a party buffet. Garish colors, irregular shapes and rough brushwork blend together into chaotic, seemingly disorganized compositions. Paired with playful titles, the abstractions slowly pull together into scenes of dinners and parties, encouraging a playful and imaginative viewing experience. Peering into these paintings, subtle images emerge — a partial face, leaves and plants, maybe a cartoon speech bubble. In the painting, Interfaith Leftovers, the abstract shapes suggest piano keys, palm fronds, pink tiled walls, and perhaps a few elongated white faces — or are they ghosts? In Salsa Wash, a black silhouette of a tomato sits next to a yellow blob with a pointed tip, which when paired with the tomato, immediately resembles an onion. 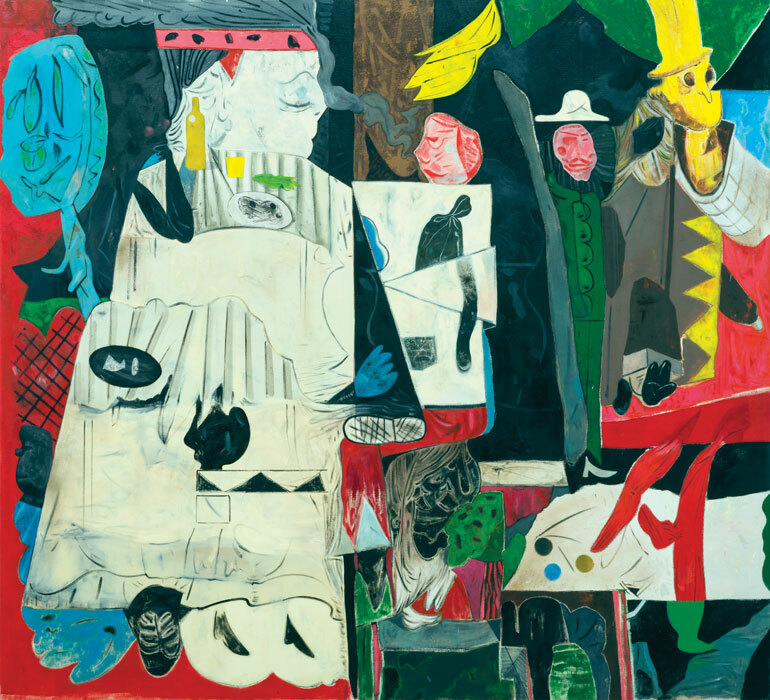 Stylistically, Anderson’s paintings look to expressionism and Cubism. Farm to Table Dinner Theater resembles works by German Expressionist painters such as Max Beckmann or Ernst Ludwig Kirchner, both of whom liked to paint theater and party scenes. Interfaith Leftovers has a cut-up, geometric composition that feels much like a Picasso or Braque collage. 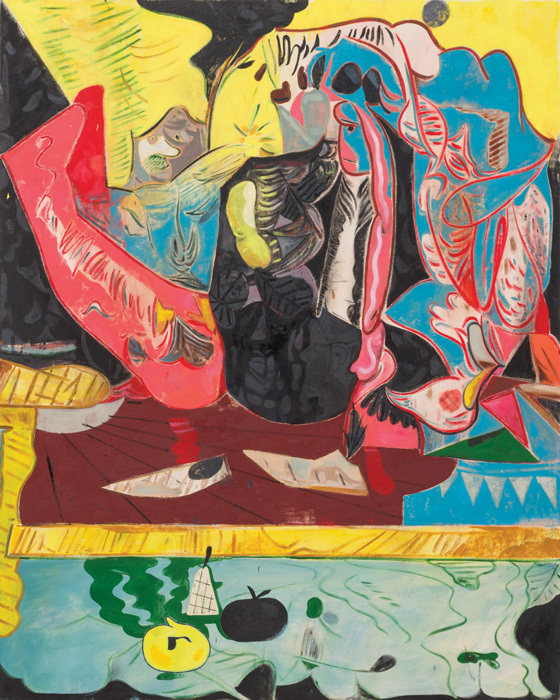 Another of Anderson’s paintings, Oligarchs at an Olive Garden, contains a number of pink fleshy masses and shoes, all done in a lumpy cartoon style that surely references the paintings of Philip Guston. Looking at abstract paintings is often like staring at clouds; a viewer reads into the shapes what they want to see. In psychology, this is called pareidolia; it’s the basis for Rorschach’s inkblot experiments, or why you can hear purported secret messages when music is played backwards. But text can completely subvert these subconscious associations, directing us to see things where they do not exist. The titles of Anderson’s paintings do the heavy lifting, priming the viewer’s brain, offering up interpretations that can be read into the abstract imagery. After reading a title like Oligarchs at an Olive Garden, what were just abstract patterns suddenly turn into wallpaper, funny-shaped blobs of paint become spills of sauce and noodles. Once you are told the abstract painting represents an olive garden, your brain sees a restaurant. Surely a different set of titles would yield different sights. If the paintings’ titles were warfare themed, the abstract shapes might transform from food to dismembered bodies. Similarly, what if Picasso’s famous painting, Guernica, which depicts scenes of the Spanish Civil War, was instead titled “Happy Day at the Rodeo?” Our understanding of the image would change completely. It is as if Anderson has inverted the artistic process of his predecessors. Rather than starting with a face or a wine bottle and abstracting it into obscurity, Anderson has painted abstract shapes and pushed them until they look like a breadstick, a house plant, a dinner party. Anderson’s “Supper Club” is like looking at the scene of a crime, trying to piece together what has happened, or like the aftermath of a party buffet, in which only empty dishes, napkins, scraps of food and dirty table cloths remain. By searching through the chaotic compositions, one can reconstruct a scene from the visual debris. Rather than constraining our imagination, Anderson’s “Supper Club” encourages us to think playfully, like a child staring at clouds.